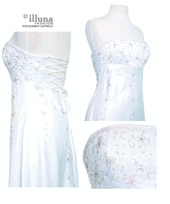 Bridal Dress Beaded Satin White Lace Up Back Faviana 5753. Strapless with transluscent sequins in floral patterns. Exquisite shimmery satin with subtle aline silhouette.